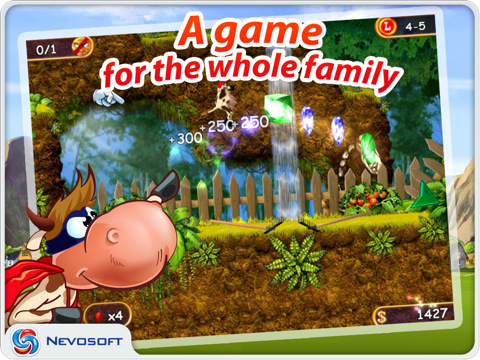 Supercow: funny farm arcade platformer HD (Universal) This is surely the coolest arcade game to date for the iOS platform. Run, jump, collect coins, gems and find secrets in a game much like the Super Mario Bros. of old. It is by no means a new concept, but the game type is perfect for the iOS platform, and Supercow brings a new kind of cool to the genre. 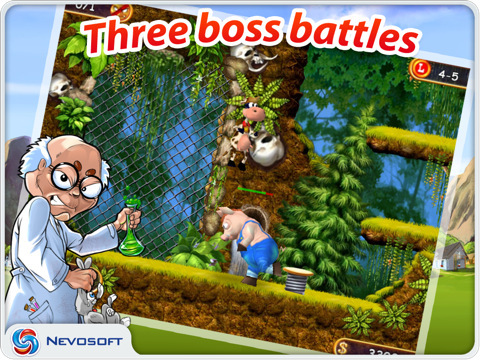 Supercow is a hero determined to save his fellow animals from the mad Prof Duriarti who has escaped from prison and is creating clones from the animals. The graphics and sounds are great, and the experience is completely immersive and you will find yourself playing it for hours. You get four different options for controlling Supercow, and they all seem to be comfortable and easy to use. Each level has a goal, but it’s the way in which you get to the goal that is most exciting. Supercow can jump onto roofs, clouds and objects like barrels and matresses – some with really surprising and helpful results. There are also hidden objects that can bounce him, or cliffs he can fall off, don’t just assume that what you see is all that is available and there are often multiple paths to the destination. Supercow also has to make his way past a myriad of adversaries that try to thwart his efforts, but jumping on them eliminates them and drops more coin for Supercow to collect. Just when you have been going along nicely a “boss” level is thrown at you, and you will need your superpowers to pass it. The level of difficulty is very reasonable, which allows you to play at a fast action pace which keeps it more exciting. For the competitor in you, there are trophies and awards to be had, and can be shared on Facebook and Twitter, it also supports Game Center. AppSafari review of Supercow: funny farm arcade platformer HD was written by Richard Best on July 18th, 2011 and categorized under Action, App Store, Fun, Games, iPad apps. Page viewed 4116 times, 1 so far today. Need help on using these apps? Please read the Help Page.